Recent visit of PM Modi to Silicon valley has enthused the technology entrepreneurs and PM has taken personal interest in creating a Digital India. The important issue is the enormous possibilities for small entrepreneurs using mobile sets and also reducing corruption using the digital wave. Nearly 70% of our economy consists of the service sector, to which the fastest-growing segments belong. They are construction, road transport (both passenger and goods), hotels and restaurants (also dhabhas), wholesale trade and retail trade, and all other types of businesses and services. Each of these activities is growing at more than 7% compounded annual average real growth rate in the last decade, and these are our engines of economic growth. These are the segments where the mobile phone is used widely, as an instrument that enhances market efficiency and raises incomes for entrepreneurs. The business model of Manju my plumber has dramatically changed with the arrival of cell phone. Earlier people used to visit him or call on his land line in the mornings and lodge complaints. He used to visit them and retire by lunch time. Now with his mobile phone his model is 24 by 7. He says his income has gone up by three times and he has one assistant. Mobile phones have created a sort of tsunami among the lower-level entrepreneurial groups, such as plumbers, carpenters, masons, small-time construction contractors, painters, cooks, auto repair mechanics, winders, welders, water-suppliers, tea suppliers, vegetable vendors, other retail traders, tyre-repairers, istri-wallahs (mobile ironing service), flower vendors, auto drivers, priests, astrologers, and so on. Actually, more than three hundred categories of self-employed entrepreneurs use them widely. One of the major forces impacting the financial, labour and product markets is information technology and telecommunication. It seems that, in the long run, telecommunications will be a major competitor to financial institutions as more than 60% of the cost of operations of many global banks is on software and telecom. The service providers initially provide an overdraft or revolving credit facility to the retail trader, which is adjusted on a daily basis by crediting the retailer for every debit incurred by the buyer. This is one of the interesting possibilities, wherein the retail trade network is provided a credit facility and which reduces their cost of borrowing. It requires one mobile instrument with them and periodic crediting of their account based on received calls, which are mostly available free. There is an Rs 7 lakh core market available for service providers in retail trade itself. This is currently funded by Chits/NBFCs/Money lenders etc. Instead of permanently singing the Walmart Sankirtan, we should think of innovative ways wherein technology could facilitate the vast mass of self-employed groups. The millions of entrepreneurs involved in retail trade, instead of being abused, as ‘unorganized’ can be made more effective by credit enhancement and price discovery process using mobile telephony. It is not required for Walmart to come here and squeeze our farmers and small manufacturers and sell it to consumers at ‘lower prices’. We can think of leveraging on telecommunication to make all factor markets more efficient and bring down consumer prices. Prior to computerised system of reservations Railways were bedevilled with corruption in allotment of berths/seats etc. It used to be told that central Cabinet ministers used to recommend postings of TTE at major stations. But after introduction of software based reservations the level of “subjective” decisions and hence corruption has definitely come down. Similarly in Bengaluru house property taxes can be paid through the net using either credit card or bank transfer. Earlier one has to visit the local office of the corporation and invariably have interactions with officials and bribery becomes part of the scene. But now based on the calculations, one can pay directly through the net. 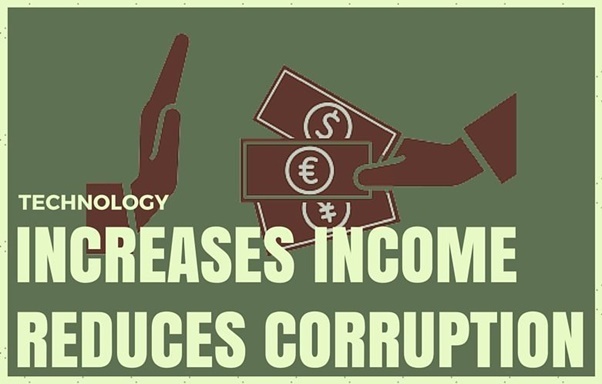 There are many more illustrations to illustrate that technology can be used to reduce corruption. In our context mobile technology is more useful given the cost and literacy considerations. ← Re-Visiting Ram Janam Bhoomi- Disgraced “Eminent Historians” should be made Accountable.